thing created in nature, I am inspired. of dancing on a breeze. my voice in sculptural pottery. on a wheel while creating initial shapes. resonating with the creation of life in each piece. the carving process and the finished product. intertwined with reflective glazes to hold food for the soul. 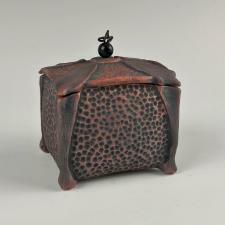 Lidded Vessels hold memories for heart and soul. there are no duplicates in my repertoire. Each has an individual voice. simplicity of a single leaf. and as subtle as a whisper. I am a full-time artist. I create wheel thrown vessels, sculpturally carving them to reflect nature and movement. Prior to my full-time devotion to clay, I was employed with Twin Rivers Council for the Arts. My position evolved from front desk/ticketing to Program Director and Interim Executive Director. I have an Associate Degree in Interior Design and Sales, having 30+ year involvement in residential building and design, and 11 years estimating and managing projects with an award-winning graphics firm. I have a love for creating with my hands. My start in pottery came in 1995, attending Southern Minnesota Clay Center’s 6-week class offered to the public. 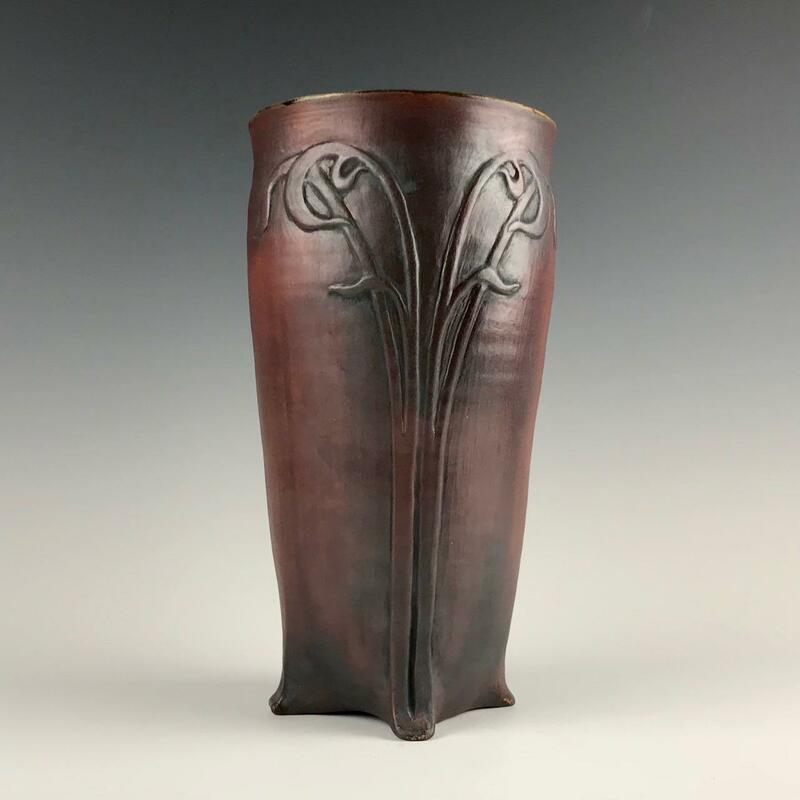 I took every class for 2 years, missing none – save one, and then held a position as a Beginners Clay Instructor, co-teaching with a fellow potter. This stopped short on March 29, 1998, 5:38 pm – with sirens blowing, warning of the impending F3 tornado. With the clay facility in rubble, I built my own studio in 1999, surrounding myself with trees; my healing process beginning through nature and clay. Regrouped, SMCC continued to offer classes from their new home at the Arts Center of Saint Peter on Minnesota Avenue. I co-taught beginning pottery classes again for 2 years. 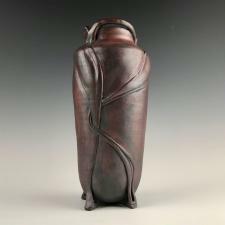 I began reclaiming my own work and dedicated my focus on my own throwing and carving skills as my work was evolving. I submitted and was accepted into my first Prairie Lakes South Central Juried Arts Exhibit in 2002. With a passion for art instilled in my being when I was young, I wanted to help others find their passion as well. I began dreaming of a way to support creativity in others. My focus now had a purpose, and RiverCrossings art fair in motion was born. From 2006 through 2009, we celebrated four annual events of RiverCrossings art fair in motion. This art crawl exposed patrons young and young at heart, to newly emerging and established artists within individual studio settings in the surrounding Saint Peter, Mankato and North Mankato area. 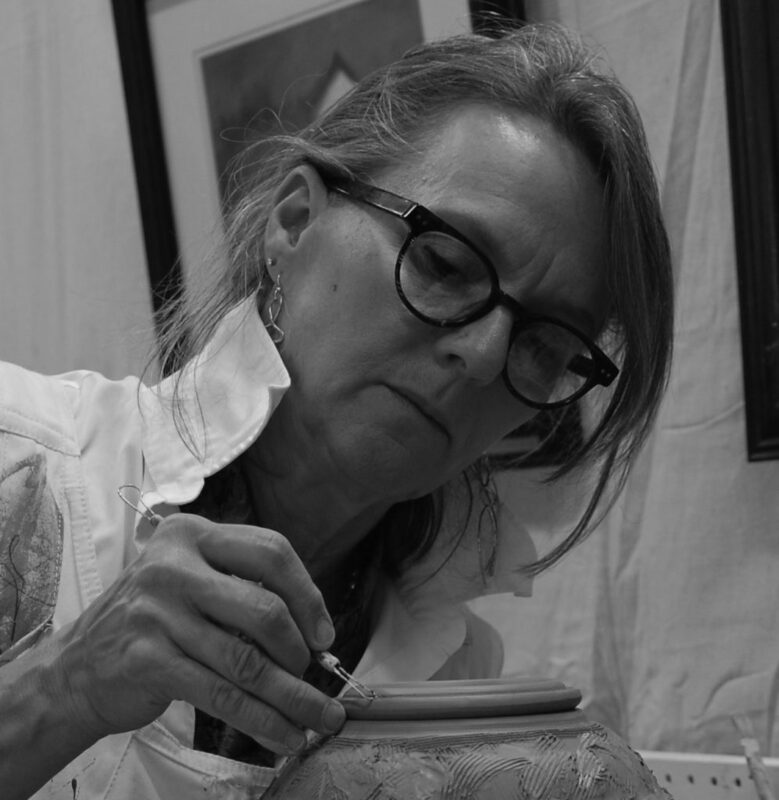 In addition to offering her work to collectors, we interviewed Michelle at her St. Peter, Minnesota studio in March 2018 to learn more about her inspiration and career. Our discussion began with her career as an interior designer, moved to her love of clay carving and Art Nouveau, and finished with her focus expanding from cremation urns to include Living Journey Vessels and more sculptural work that celebrates the living. 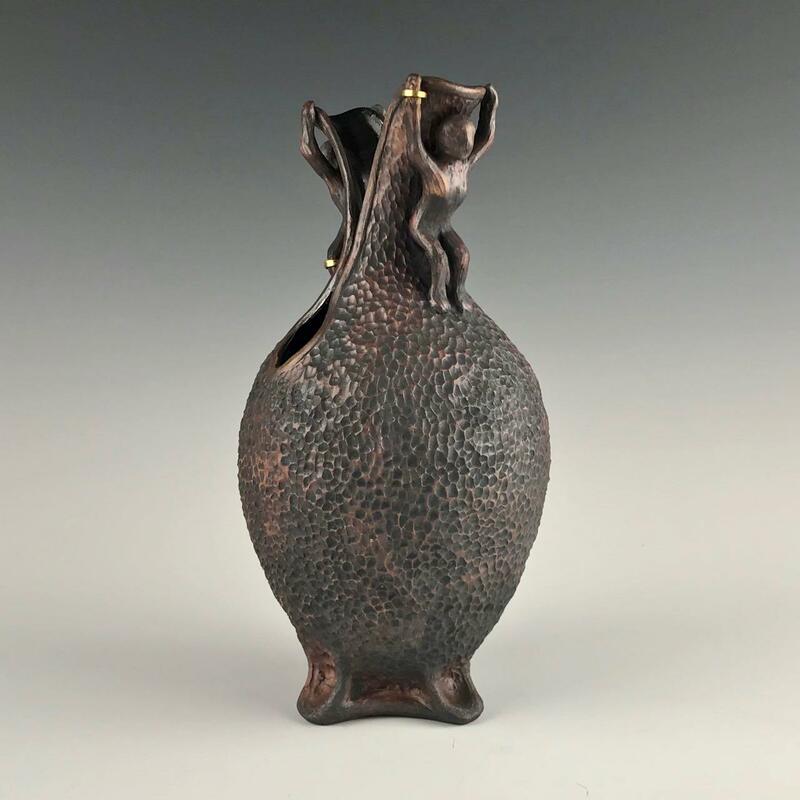 Steve Basile, Curated Ceramics: Can you tell us about your early life? Michelle Kaisersatt: I was born in St Peter, Minnesota and raised in Le Center, a little town with a population of about 1600, that is 12 miles from here! After high school I received a degree in Interior Design at Dakota County Technical College. When studying the different periods of design, I absolutely fell in love with Art Nouveau. It resonated with me. We were required to learn all of the different periods in history. It was so rich for me, I think in a previous life I must have been from the late 1900’s. Kaisersatt: We had a great history teacher, Jim Cherry. He captured our imagination through his passion, and was a phenomenal art history instructor at Dakota Tech. History and interior design are congruent. They influence each other, and you need to be able to recognize those influences. Art Nouveau made a huge impact on me. That – and the Arts and Crafts movement, which followed in history. Curated: What sparked your interest with interior design? Kaisersatt: I always loved art and the creative process. When I was a teen, I would rake freshly cut grass into imaginary house plans – on the lawn. That is where I discovered the influence of space and how it integrated with living. Once I received my degree, I was drawing up house plans, working with fabrics, furniture, window treatments, and floor coverings, for over 30 years! My love for pottery didn’t evolve until I was 35 years old. I knew I loved art, and I realized I would at some point, need to identify my voice – when my children were out finding their own. I needed to know who I was. Simultaneously, the Southern Minnesota Clay Center (SMCC) was launching. The brain child of Lois Peterson, a ceramics professor at Gustavus Adolphus College (St. Peter). 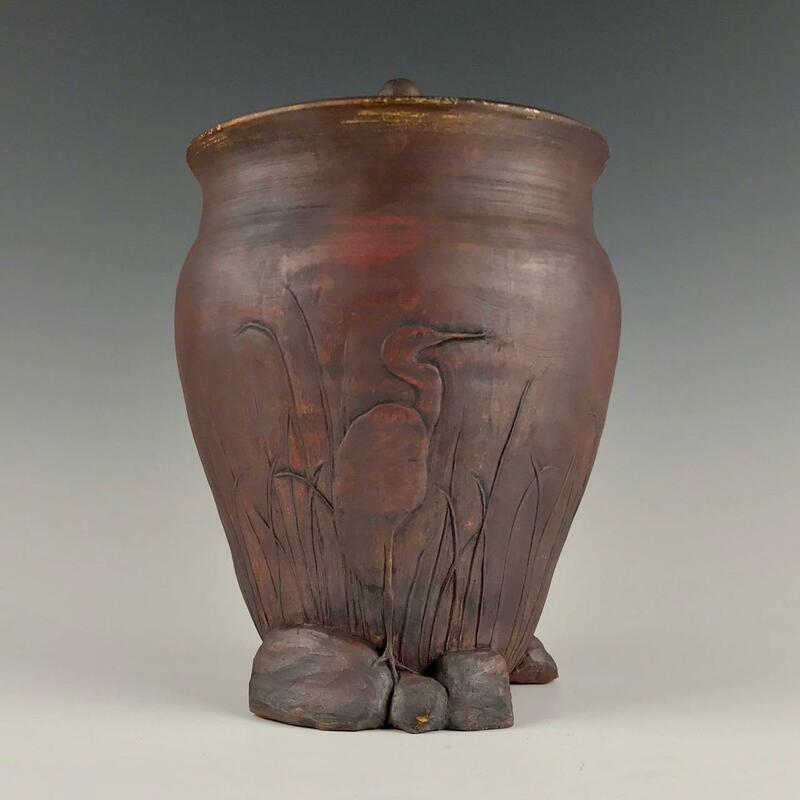 Lois had received a substantial grant from the Blandin Foundation for a community ceramic studio with wheels and kilns. That was my introduction to clay. Curated: So a clay program at Gustavus spawned a community clay center in St Peter and you started taking classes. Kaisersatt: I fell in love with clay from the get go. I loved it and was very compelled by it. There is nothing like clay on a wheel, feeling that clay through your fingers! It is very tactile. Curated: How did you come to your current art aesthetic? Kaisersatt: In 2002 I started experimenting with leaves. My studio was out in the woods. So, the influence of nature was – in front of my face! I would collect a Sumac branch, trace its shadow on the vessel, and then study it and carve it. Because of my love for Art Nouveau history, I gained an extensive library of research and history books. One of my earliest challenges was figuring out how to carve an acanthus leaf. A staple in the history books. 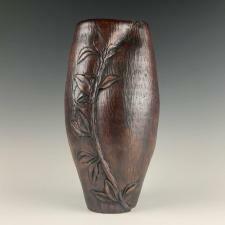 I worked and worked on how to carve that leaf with depth, translating it and adding movement into a piece of clay work! So, I would ebb and flow between carving leaves and interjecting movement influenced by Art Nouveau into my pieces. Gradually through time it merged together and became my own style. The pieces I’m doing today are those very elements of Art Nouveau and nature merged together. I love it and can’t get enough of it. Carving is an element I would be happy doing every single day – just carving. Curated: When did this hobby become a profession? 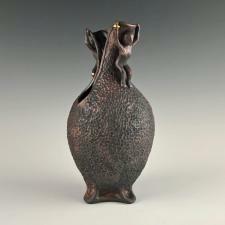 In 2008 I decided to launch my career as a potter, and created a website to market my pieces. In doing so, I had to find a market that would resonate with what I created, knowing that each piece was unique and highly carved. How could I find an audience that would want that? Sometimes I would spend 20 hours on one piece. I wanted to find an audience that ‘got’ what I put into each piece. Soulfully, and artistically. Before launching my website, I did a lot of research. Trying to figure out what audience would best pair with my work – since I spend so much time on my pieces. I knew my work was not typical clay audience type of work. I wanted to find that clientele that would see my work as reverent and appreciate the sculptural voice. Curated: This is also the sculptor emerging. Kaisersatt: Yes. I’ve always wanted to make art objects. I wanted to create art – in clay. Something that was more than special to the recipient. Curated: You wanted to make art that was an expression of your life or one that you shared with your buyer? Kaisersatt: Definitely both. I’m a minimalist when it comes to material goods. I remember my teacher, Lois Peterson, saying, “remember, if this gets fired, you have created a piece that will never disintegrate. So, it better be good.” That stuck with me! 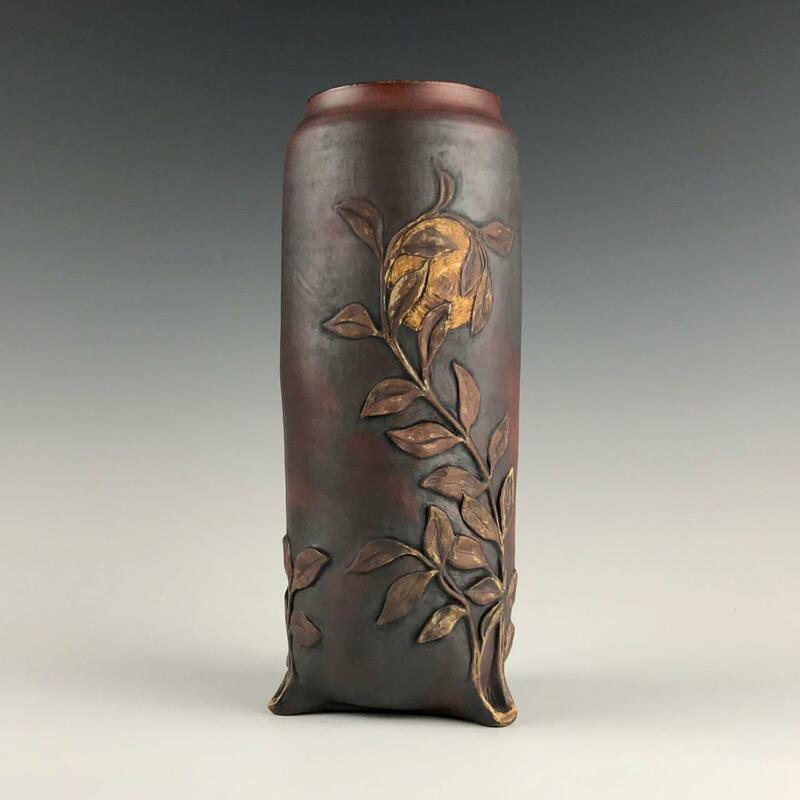 Curated: At what point do you wake up and say, “my place in clay is in doing artistic sculpture objects.” Where does that come from? Kaisersatt: Creating pottery was a spiritual message for me. I wanted to create art that spoke to my reverence for life. I wanted to find an audience again, that would get that. That’s why I began to study what would be a good avenue for my business. I first wanted to be a sculptural clay artist. I always loved bronze. Paul Granlund, a famous bronze artist had his studio at Gustavus Adolphus College (1971-1996) here in St. Peter. I loved his work and how clay creation translated into bronze. However, I didn’t give myself permission to be a sculptural artist for a long time. I started doing more movement in my pieces, those elements of Art Nouveau. Then I started adding in nature elements. I remember my aunt loaned me the book Centering in Pottery (MC Richards) early in my career. That was so influential in my pieces becoming so spiritually driven – because of the message in that book about being ‘centered’. Curated: So your work took inspiration from Art Nouveau then went directly to their inspiration and began incorporating nature. What are your contemporary references for inspiration? Kaisersatt: I go for walks. I search out cattails, gingko leaf, olive leaves, crabapple blossoms and leaves. I observe stones near the water, and willow trees. I love the beauty of a fresh spring Willow branch! I study olive leaves with berries. Grapevines and grapes. I ventured into one particular bird, the heron. It flies over my house daily in the spring and summer. It is the only bird I’ve ever done. I also carve feathers from the local visitors that fly over my back yard. Curated: We’ve talked about Art Nouveau and Arts and Crafts. Are you making your way thru time in decorative arts? Kaisersatt: No, I’m sticking with Art Nouveau. Although I also dabble in Arts and Crafts because I like the symmetry. Curated: Who in history did you feel were fine practitioners of Art Nouveau? Kaisersatt: Of course, my first loves were because of the study of architecture within interior design. The Metropolitain (Paris Métro) sign. I would drool over that. In fact, I saw it firsthand this last October when I traveled to Paris. Curated: So you’re talking about Hector Guimard’s work? Kaisersatt: Yes. Before his work, I ran across Adelaide Robineau’s work. I studied her work and also Artus Van Briggle’s. He was huge for me. I even went to the Van Briggle Factory in Colorado Springs years ago. 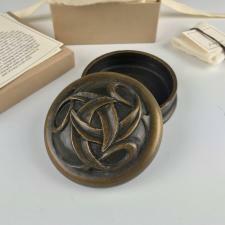 I had books and books of Art Nouveau and architecture. In fact, I couldn’t find many clay carving books, so I would search out woodcarving techniques in architectural detail trim books, just so I could understand it more. 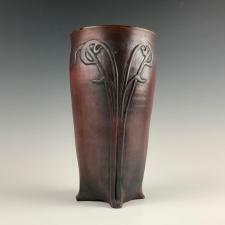 I would look at the wood techniques to use those within the clay carving process. They are quite similar. In fact I would buy historical books on decorative crafts in houses, to study line and design. Curated: Any other Paris museums? Kaisersatt: Musée de l’Orangerie. When I walked into the period rooms there, it felt like home to me. And Musée d’Orsay. Walking and seeing the Parisian architecture was almost overwhelming! Going into churches and seeing different elements of detail. There was one particular church, Church of the Magdalene, with a famous naïve of Mary in the clouds. It was twenty feet deep and all marble. I studied those clouds and the lovely flow of her garments melting into the clouds. Wow! Now I play with elements and create positive and negative spaces. Using those examples and design lessons I learned in interior design. I bring all of those elements into play in my pieces. 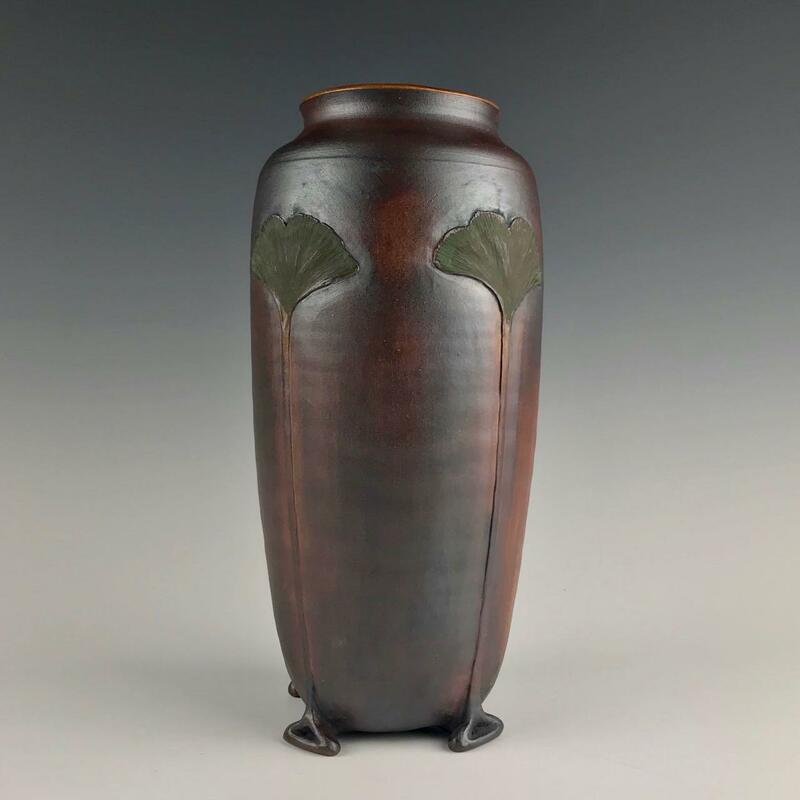 Curated: Let me ask about your time focusing on pottery urns. It was something collectors used to singularly identify with you. How did you find urns as a form for your work? Kaisersatt: I was trying to find that niche that would accommodate my time, design elements, and business. Urns merged those together. I would’ve been very happy making vases, but I knew I had to go down a path that would be more financially sound. I was trying to prove myself as an artist – to my husband and to myself. And creating urns gave me more freedom, because it was something that would be ‘kept’. It allowed me to spend more time on a piece. To experiment. Curated: It seems selling your work legitimized your expression in art? Kaisersatt: Yes, and that acceptance didn’t come until the month before my husband passed (2017). For both him and myself. I’ve always struggled with calling myself an artist. I actually earned First Place in a juried arts exhibit, but it took me awhile. Little by little I’ve gained confidence in my own work. 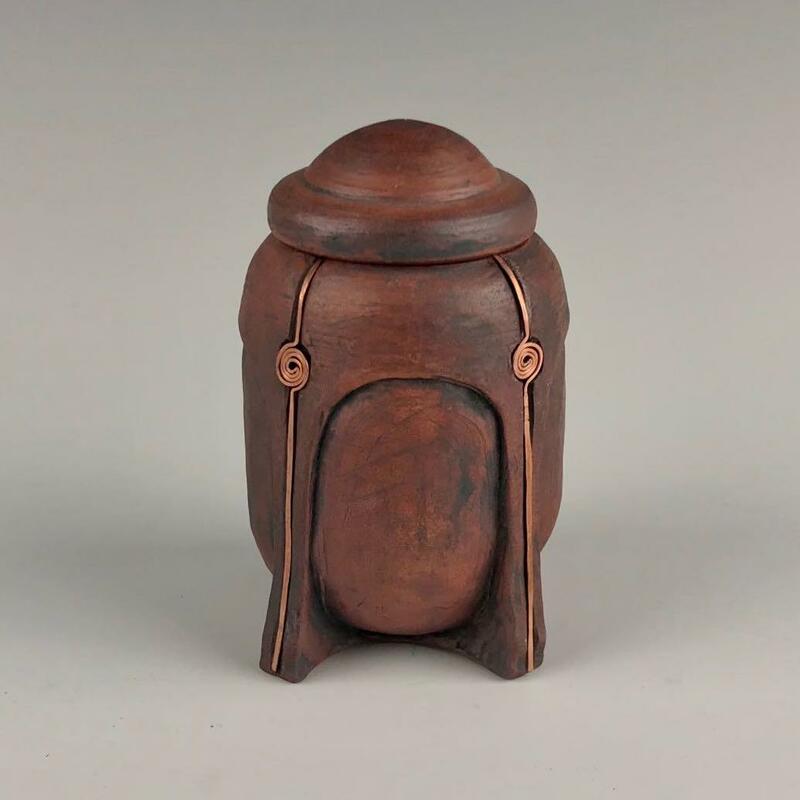 Curated: The urn also fits in with your desire to make revered objects. Even if it’s not used for remains. It’s an art object. 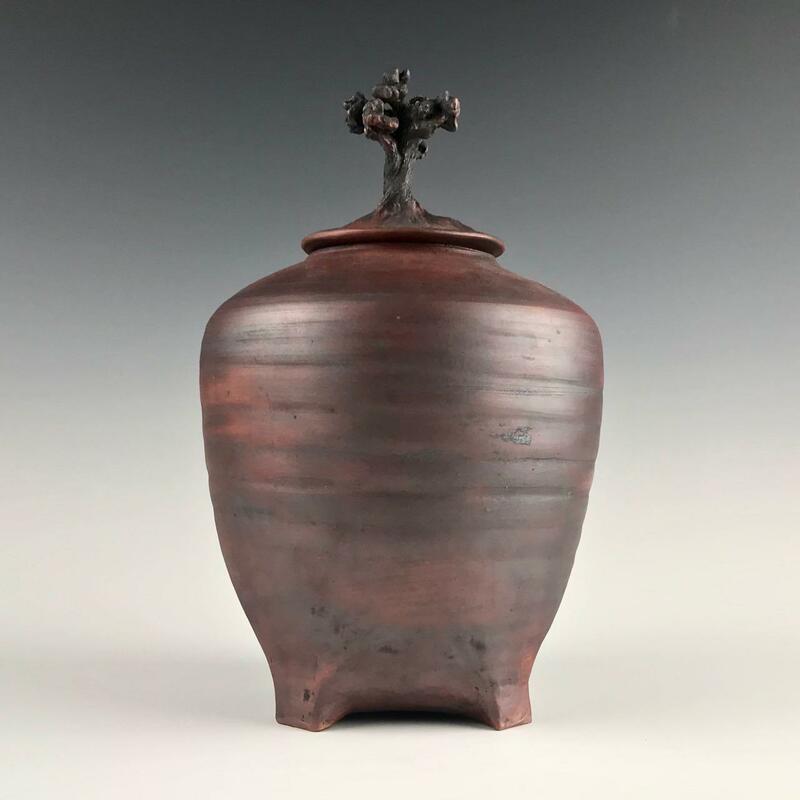 Curated: Making urns at first must have seemed a double-edged sword. First, with an urn you’re already making a revered object. Then you’re also creating art in clay. You’re not throwing pasta canisters. So, it’s a pretty steep hill to climb going right to making revered art objects. Kaisersatt: Especially during that particular time period in my business. 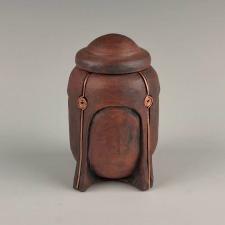 Cremation urns were just beginning to enter society’s conversations. The Catholic faith, for example, requires burial. And many people choose the typical burial over cremation. Also, many people love their pets as much as people. So my urns have been sold for both people and pets. I think if you separate the use of the urn between people and pets then it’s a mistake. For many people, pets are their children. Sometimes I work on small keepsakes and other times I create large vessels. I never feel they fit one particular slot. 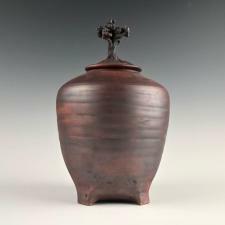 I really look at urns as a reverence for life in general. I never looked at it as a pet versus a human vessel. Never did. They are our ‘loved ones’. So the pendulum for me has now shifted toward living people. Buying vessels and putting mementos and stories into a vessel while people are here, as a gift for family when it’s time to pass. You’re sharing your story because of the things you’ve placed into this vessel. It’s looking at life differently. Life is not only about when we’re gone. It’s about when we are living as well. 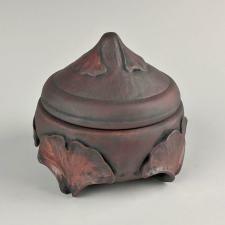 Curated: So, you have urns and living journey vessels. What about your commissions? How do you reconcile a commission with your need for creative expression? 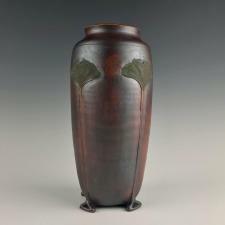 Kaisersatt: My requirements are only that it be a lidded vessel, have red iron oxide stain on the outside, and be carved with a nature influence. 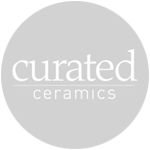 When I do a commission for a client, it’s important – just like what Curated Ceramics is doing – to learn the story. As an artist you are helping create their legacy. I have two examples to share. One woman planted a tree when her husband passed. After learning her story, I suggested she collect up some leaves from that very tree and I would carve them into a vessel. Which I did! It is so important that these vessels represent them. Not me. Another commission was for a friend who lost her husband. He was a motorcyclist and dirt bike rider. The wife sent me gears from his own shop. The energy I felt when I opened up that box! I kid you not. The grime was still there – from his own fingerprints. It was so powerful. I created a design that was reflective of his interest – and energy. I brought his essence and those design elements together to create a piece that captured his life, carved with gears and spokes. Curated: How can I tell urns and living journey vessels apart? Kaisersatt: There is no way. I’m trying to embrace more of the celebratory existence. They are truly intertwined. Curated: Let’s go back to when you finally granted yourself legitimacy as an artist. Can you tell me how that came to pass? Kaisersatt: I’ve always looked at art as a means of processing life. Sometimes, yes, you put it aside because you’ve got other priorities. But then you realize how integral it is in keeping your own sanity. It took me years to realize that I’m a sculptural clay artist. It took a long time to say that out loud! Curated: So, do you see other things bubbling up for you? Kaisersatt: Being an artist and strong arts advocate, there are people in this world whose purpose is to create art. I’m one of those people. I’m a very spiritual person. Not religious. I am very connected to nature and feel the whole world is the most beautiful art gallery. You look at the leaves, the flowers, the animals…it’s a living art gallery! And I believe everyone is creative. If we don’t tap into that creativity, we lose part of ourselves. We lose a very important element of humanity. I believe every person has a creative voice. When I say creative, I’m thinking ‘creative process’. Meaning a farmer, a lawyer, or a dentist. They all need to think creatively to find a way to solve challenges. That is my soapbox in my life. We are all creative.